In 1936 Peter Walker founded the Acoustical Manufacturing Company, which for many years produced public-address systems. In the years after World War II, Walker expanded his companys product line to include high-fidelity equipment for the home. The brand Quad, originally an acronym for Quality Unit Amplified Domestic, was begun in 1949. Since that time, Quad has been a leader among British audio manufacturers. Walker was presented with the Queens Award for Technological Achievement in 1978. Quad is best known for their amplifiers and electrostatic speakers, such as the very first full-range electrostatic, the ESL-57 (aka "Walkers little wonder"), and the current ESL-988 and ESL-989. These speakers do indeed sound fantastic, but most people will find two problems with them. First, theyre rather large (the smaller ESL-988 measures 37"H x 26"W x 12"D), and dont blend in with many living rooms; second, theyre expensive (the ESL-988 now lists for $7000 USD/pair). Quad has recently introduced a line of dynamic speakers, the L series, that brings the hallmark Quad sound to a product line that many more people will be able to afford and enjoy. The series consists of two bookshelf speakers, the 11L and 12L, and two floorstanders, the 21L and 22L. For those who prefer multichannel home theater and/or music, matching center-channels and subwoofers are also available. Here, I take a close look at my favorite L model, the 21L floorstander ($1300/pair). Like all Quad L speakers, the two-way 21L looks stunning. Its cabinet is made of 18mm-thick MDF covered in real-wood veneer. Each of the seven layers of piano lacquer is allowed to dry for 24 hours before the next coat is applied. The 21L comes in four standard finishes: maple, birds-eye maple, piano black, and cherry; there is also a limited edition in yew. Anyone worried about spousal approval neednt worry: the 21L measures only 31"H x 8"W x 10"D; a pair of them can be easily and unobtrusively worked into even a formal living room. My wife and I collect Stickley furniture and our cherry Quads nicely blended in without calling attention to themselves. The Quad 21L has a 25mm textile-dome tweeter and a 6.5" woofer, and is rated as being a 6-ohm load. On the rear of each speaker are two sets of heavy-duty, gold-plated speaker terminals to facilitate biwiring. Quad suggests biwiring at the speaker end even if your amplifier has only one set of speaker terminals, to minimize crossover stress. This should provide a noticeable improvement in sound, but I didnt have a set of biwire cables and was unable to take advantage of this feature. Im eager to do so in the future, but my setup needs long cables; biwiring would be expensive. The 21Ls come with bridge connectors if you choose not to biwire. The speaker comes with a nice set of floor spikes that screw into its base, and rubber feet to place the spikes in if, like me, you have hardwood floors youd rather not damage. The spikes add about an inch to the speakers height. Each 21L weighs close to 35 pounds; while it was helpful to have an extra set of hands for unpacking them, moving them around to get the right placement was easy enough on my own. The 21Ls should be set up at least a few inches from both the side and rear walls. If theyre placed too close to the rear wall, the bass will get boomy; moving them just a few inches will solve this problem. Optimally, of course, the speakers should be as far from each other as they are from your listening position. While some speakers can be persnickety about this, I found that the Quads allowed a pretty wide seating area with little loss of imaging. Getting speaker placement right can really enhance your systems sound; its worth taking the time to do it correctly. Once you have the distances right, you can play some music and slowly toe-in the speakers until the imaging at your listening seat is just right. For most of this review, I used a Rotel RA-02 integrated amplifier and Rotel RCD-1070 CD player. I also used the Quads extensively with a Sony SCE-775 SACD player and a Pro-Ject 1.2 turntable equipped with an Oyster cartridge. Finally, I auditioned the speakers with Rogue Audios Tempest integrated amplifier and the Rotel CD player. The Rogue is a high-end model that Ive liked for some time, but I lack the nerve to spend more than $2000 on an integrated amp. Still, I wanted to make sure that, were I to be stricken with upgraditis, the Quads would still serve me well. I had no need to worry -- the Quads only got better with the Rogue (I think I feel upgraditis coming upon me already). I always begin an audition of new gear with Louis Armstrong and His All-Stars playing "St. Louis Blues," from Louis Armstrong Plays W.C. Handy [Columbia/Legacy CK 64925]. This may not be the best-recorded album, but its one of the most fun. If a piece of gear cant get my toes tapping and my heart racing when I play this track, I just move on. But from the first notes from Armstrongs trumpet, the Quads had me smiling and swinging. I listened to the entire nine-minute track without hearing anything but the pure joy of Armstrong and his band. The Quads passed the Fun Test with flying colors. The most remarkable thing about the Quads was how they could seem to "disappear." Their imaging and soundstaging were such that, if I closed my eyes, I could almost believe the band or orchestra was right there in front of me. When I put on Badly Drawn Boys "You Were Right," from his Have You Fed the Fish? [Artist Direct Records 80119-01066-2], my wife came in to ask, "Are those the only two speakers on?" When I assured her they were, she said, "This is amazing. I can see -- I mean hear -- exactly where each musician is." She then pointed out each place across the front of the room where a musician would have been. The 21Ls are the first speakers Ive had in my home that created such a holographic presentation that the music didnt seem to be coming from the speakers. The music just filled the room as if materializing out of thin air. When I listened to Andr� Previn and the London Symphony perform Gershwins Rhapsody in Blue [EMI 5 66943 2], I was there in the concert hall: first-row balcony, I believe. With electronica albums, such as Erland �yes Unrest [Astralwerks ASW13321], the blips and beeps emerged from the ether with a nice bit of ambience that was missing with other speakers Ive had. My music mania crosses many boundaries. Ive noticed that some speakers really shine with one sort of music, while being merely okay with others. Dance and rock music, for example, can sound great even when the bass is exaggerated; acoustic music does not. I prefer as realistic a sound as I can get, and the Quads did an admirable job of this with whatever I played. If your musical tastes run to rock and dance, however, you might think the Quads too polite, not aggressive enough. I think they are aggressive enough, but if youre used to boosted bass, it might take you a while to recognize the beauty of what instruments really sound like. Through the 21Ls, no single instrument sounded overly pronounced; everything sounded lifelike. The 21Ls authoritative presence may be of concern to some. These speakers are not for background music -- the way they throw out music demands your attention. To me, this is good; but if youre looking for speakers mainly for background music, the Quads may be too much of a good thing. I think the 21L is the best of Quads L series. 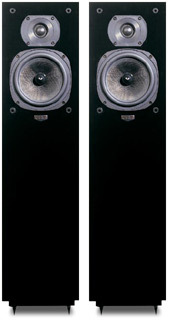 The bookshelf models, the 11L and 12L, share with the 21L the same basic L-series sound but lack some of the bass that the 21L is able to reproduce. Combine this with the fact that youll need to buy speaker stands for the bookshelf models, and I think its worth springing for the 21L. A good part of the great joy I got from the 21Ls was for their holographic imaging. If your speaker-placement options are far from ideal, however, this imaging is likely to disappear. In such a situation, you might be better off with less expensive bookshelf speakers (such as the excellent Axiom M3ti) and a good headphone setup for serious listening. I really like the combination of the AKG 501 headphones and the HeadRoom Little headphone amplifier. You could have the Axioms and the headphone setup for less than the cost of the Quads and, in the situation Ive described, you might be happier. The biggest difference in my listening habits made by the Quads has been with my headphone listening. I used to be a serious headphone enthusiast, have owned some of the best headphones (most recently, the Grado RS-2 and AKG 501), and still really like HeadRoom headphone amps. But my headphone system was unable to compete with the realism Im able to achieve with the Quads. I used to listen to headphones at least an hour or two a night; since the Quads arrived, the only time I listen to headphones is when I walk the dog or am in my office. When Im home, the Quads win every time. There are some speakers I like more than the Quad 21L, but all of them fall in the price category that includes the Quad ESL series -- that is, several times the cost of the 21L. In the 21Ls price range (I listened to speakers up to $2500), I could find nothing I preferred, and several I liked much less. If youre looking for a floorstanding speaker that will provide years of enjoyment, the Quad 21L may well be for you. Its a significant investment, but it should last you for years -- even if you begin to suffer from upgraditis. Their appearance, imaging, soundstaging, and overall sound are nothing but magnificent.